Vinyl records in a host of sizes, speeds, even shapes, were THE way to listen to music in the decades before CDs, MP3s and online storage made them virtually obsolete – for music, at least. Now artists, hobbyists and environmentalists are making vinyl “sing” in a whole new way. 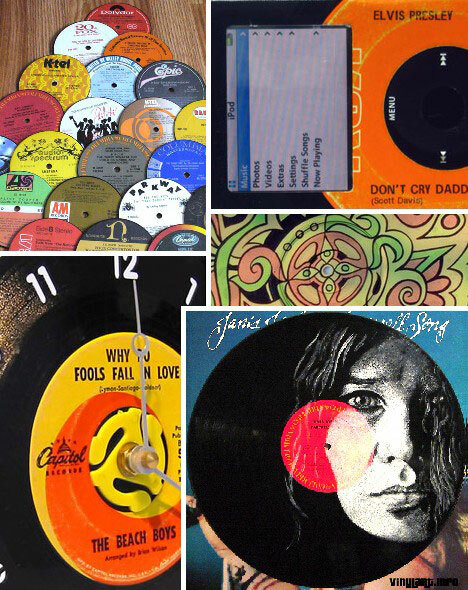 Here are a dozen groovy examples. 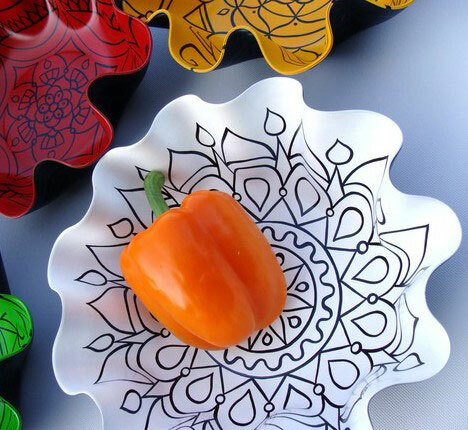 Vinyl’s characteristic ability to become malleable when heated and then “lock in” the desired shape when cooled make it ideal for craft projects. 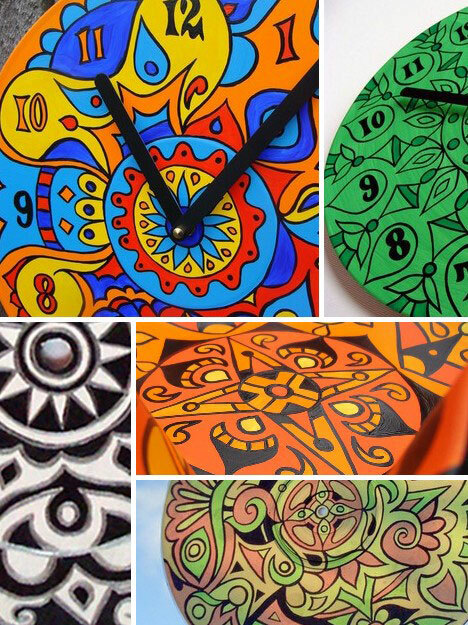 A prime example are the beautiful bowls, mandalas, clocks and wrist cuffs upcycled by Christine Claringbold of Eye Pop Art. Don’t believe your bowl was once an LP? Flip it over – the original record label is there, sealed for posterity with a glossy clear finish. 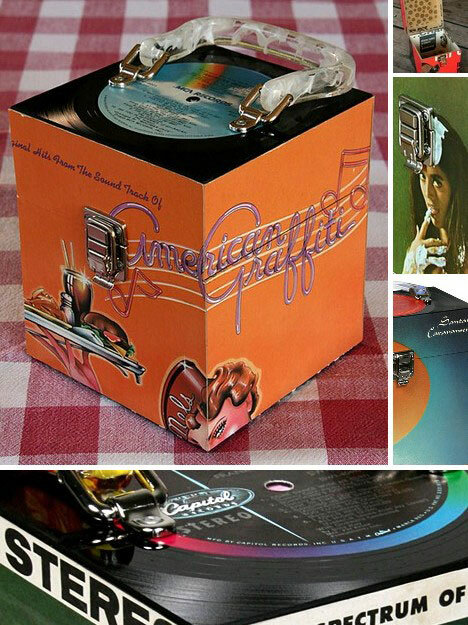 Completely food safe, Claringbold’s hand-painted vinyl revivals are a wonderful way to re-use records which have long since played their swan songs. 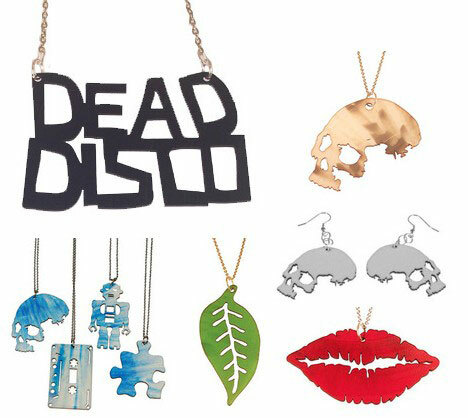 One 33rpm vinyl record can be transformed into a host of small pendants, earrings and other jewelry items if you’ve got a laser cutter on hand. The folks at VLING do and they use it to perform disco demolition on dozens of vinyl records, day after day. Their Dead Disco pendant seems to be a self-fulfilling prophecy. As for their other designs, what are the odds of buying earrings made from a Golden Earring LP? When CDs came along in the med-1980s it was all downhill for vinyl, which might just rub those records the wrong way if they could think and feel. Give them their revenge with these cool custom CD cases made from not just vinyl records but their cardboard sleeves as well. 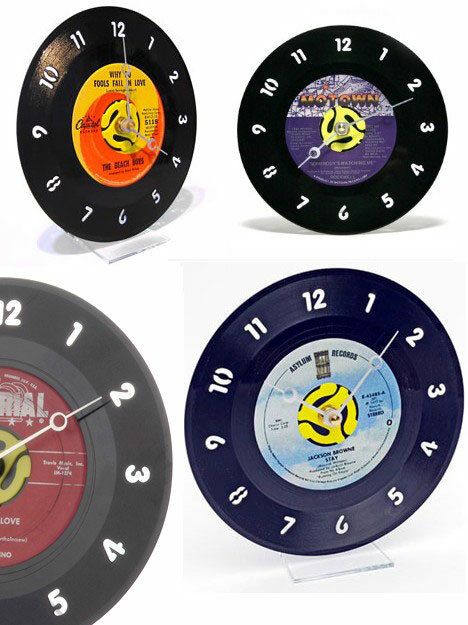 There are a surprising variety of recycled record clocks out there but the Fab Four above are noteworthy for including the little yellow thingy that adapts 45-rpm records for use on most turntables. Anyone remember what the thingy was called? Hint: it’s not “thingy”. Give up? Those of you who guessed spiders, fratzogs or Triskelions are wrong. Officially they’re known as… 45-rpm adapters. Record vinyl extends from the edge to the hole, and that include the central label. Though more difficult to recycle, record labels just happen to be the perfect size for drink coasters and a wide variety are available from a number of retailers. Cool conversation starters that also keep your table top free from those annoying rings. 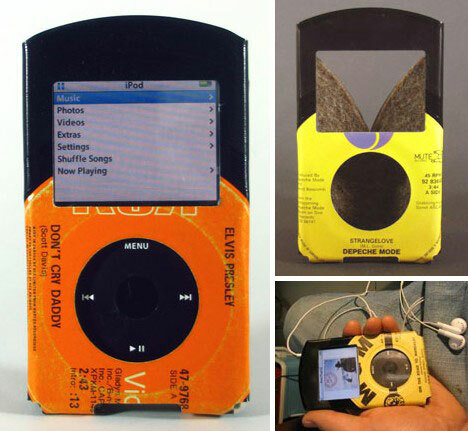 Just as a caterpillar dreams of becoming a butterfly, a vinyl record aspires to rebirth in the hippest medium of some future time – in this case, an iPod. Well, an iPod cover to be exact. The felt-lined cases have a signature feature – the regulation center hole of a 45-rpm vinyl record just happens to be the same diameter as an iPod’s click wheel. Coincidence, or just mighty convenient? 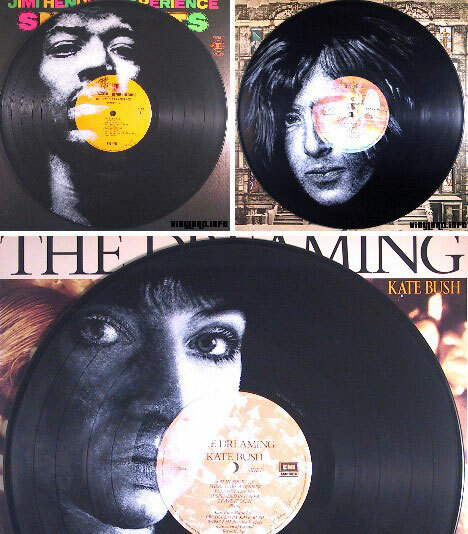 Daniel Edlen creates vinyl art portraits of your favorite musicians, on their records, using both original vinyl LPs and cardboard sleeves. Priced at $175 each, these artworks aren’t cheap but they ARE undoubtedly art and thus command the big bucks. Choose from classic rockers like Jimi Hendrix and Jimmy Page, golden oldies like Elvis Presley and even modern rapper Eminem just for starters. 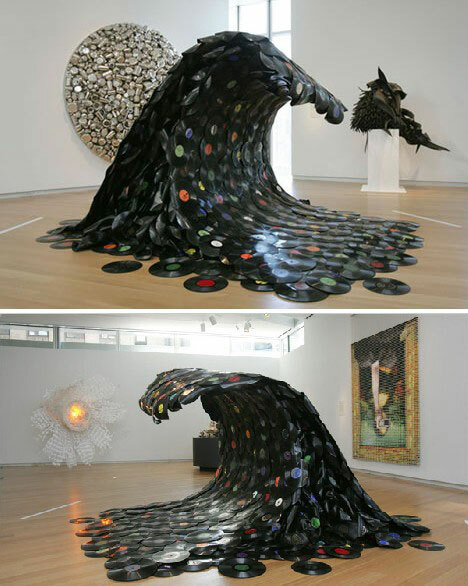 Carlos Aires is another artist who uses recycled vinyl as his medium. 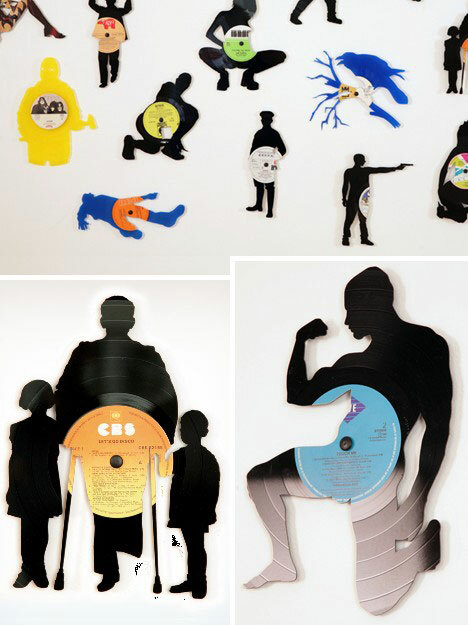 Aires’ cut vinyl record silhouettes are one-of-a-kind, as in each one being hand-cut and therefore unique. Though he works in a wide variety of media, Aires may be best known for his vinyl cutouts which he often assembles in large numbers for exhibitions. 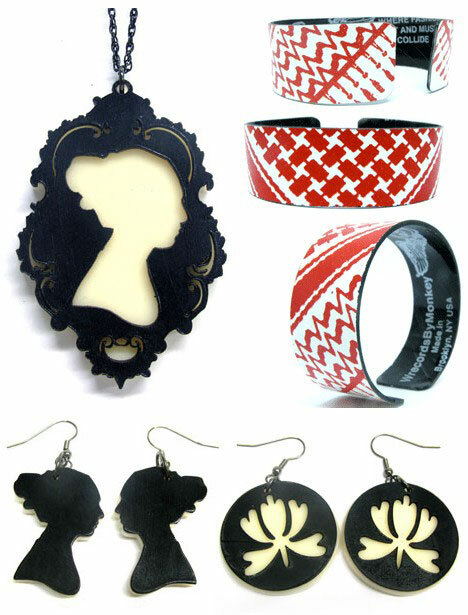 Wrecords by Monkey processes used vinyl to a greater degree, forming it into fashionable arm cuffs, pendants and earrings sporting intricate, complex and bold patterns. Once again, record vinyl shows its user-friendly side. Each new wave of technology washes away what came before… that’s the concept artist Jean Shin explores with her massive Sound Wave piece that helped open New York’s Museum of Arts and Design in the fall of 2008. Measuring 5.2 ft high by 12 ft wide by 12 ft deep, Shin’s wave of records is big enough to surf on. 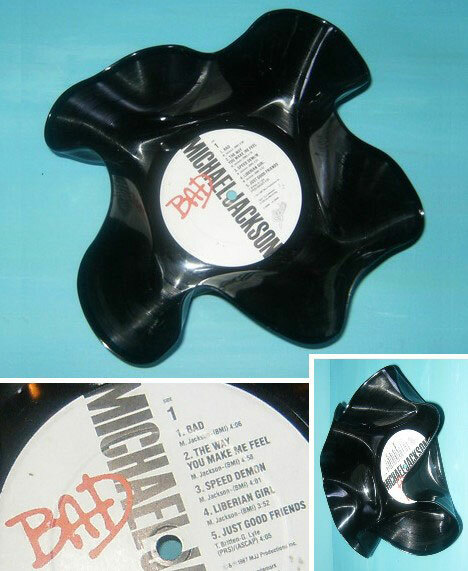 The recycled vinyl bowl above has few if any distinguishing features but it does have one very strong selling point: it’s crafted from Michael Jackson’s “Bad” LP. Indeed, the item sold out from the seller’s website on June 25, 2009, just 2 days after news broke that the entertainment superstar had died. 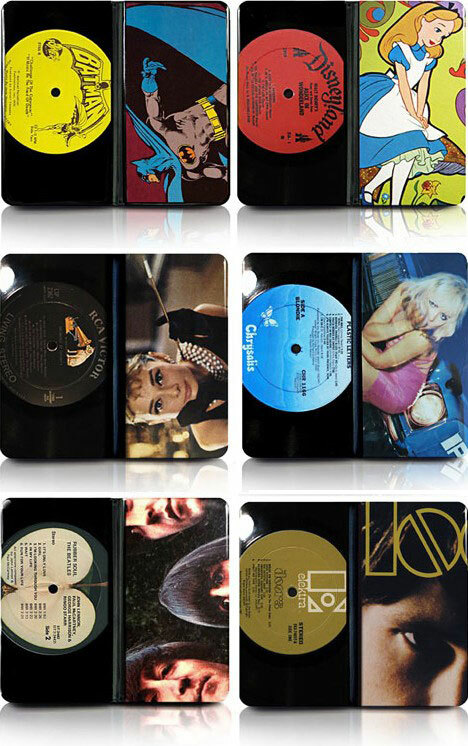 Putting your money where your music is, Black Crow Vinyl Record Wallets use recycled vinyl records to create some of the hippest wallets to grace your hip. The Beatles, The Clash, The Doors and many other greats of rock & roll’s golden age lend their labels, sleeves and groovy black vinyl to the effort. 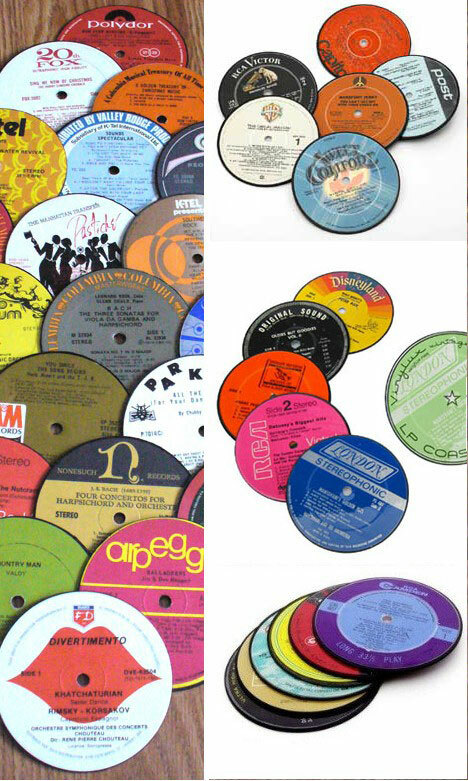 Millions – perhaps billions – of vinyl records were made since the dawn of music recording. Individual favorite LPs and singles were played hundreds, even thousands of times. The numbers are staggering but let’s not crunch them; let’s re-use, recycle and upcycle them into new products that manage to still carry a little of the magic within them. Vinyl? Divinyl!